Fall veggies are plentiful and the air is getting chilly. This dish is perfect for this time of year and really easy to make. It’s a one pot meal so the clean up is minimal, which makes it great for weeknights after work because it doesn’t take much time! You can choose what ever sausage you like. 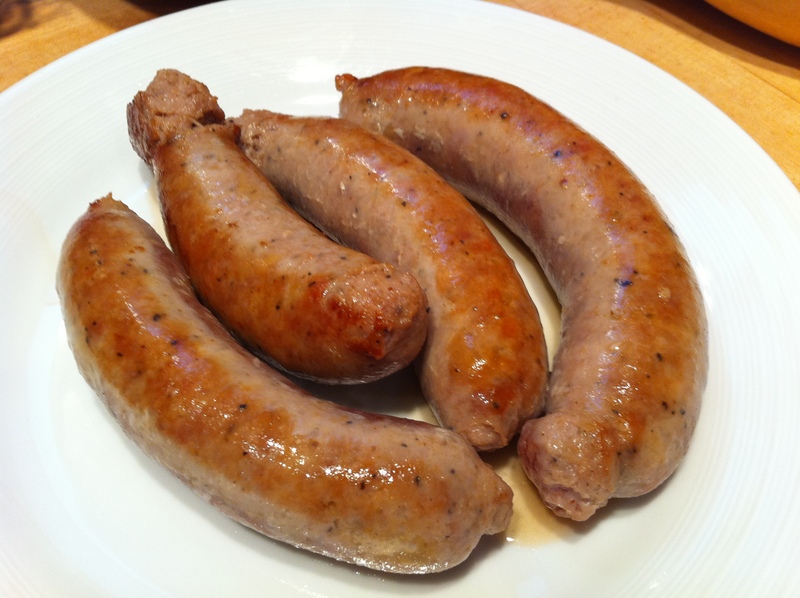 I have made this with sage turkey sausage (from The Turkey Lady), chicken apple sausage, and sweet Italian pork sausage. 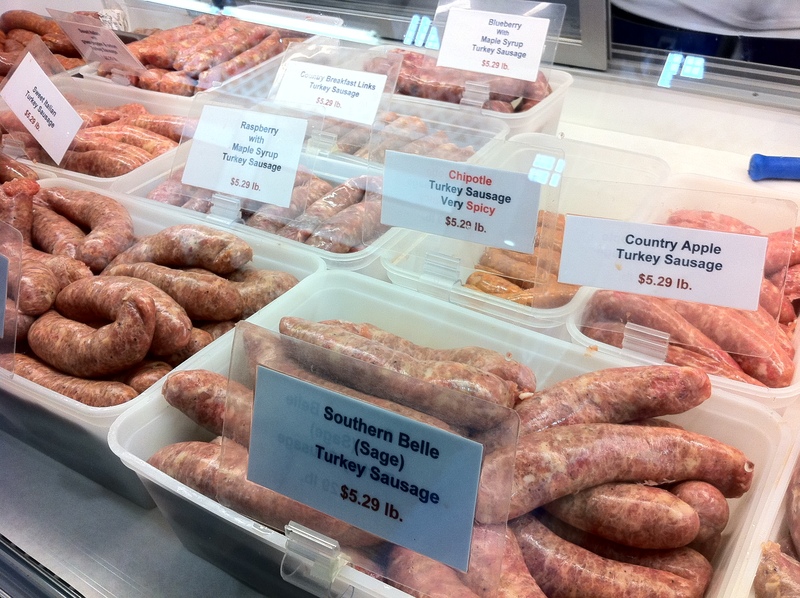 I think my favorite was the sweet Italian pork sausage. Add about 2 teaspoons of olive oil to a dutch oven set to medium high heat. Sear the sausages and remove from the pot. Chop the onion, mince the garlic, and cut the sweet potato, carrot and beets in to 1/4 inch cubes (to match the size of the beans). Saute the vegetables in the dutch oven for about 5 minutes, until the onions turn translucent. I used red beets this time, so my final dish turned out pink. I also had to substitute chick peas to the cannellini beans because I didn’t have any cannellini beans left. You can substitute with pink beans as well but I think the cannellini work best in this recipe. Chop your swiss chard or Kale into smaller pieces. 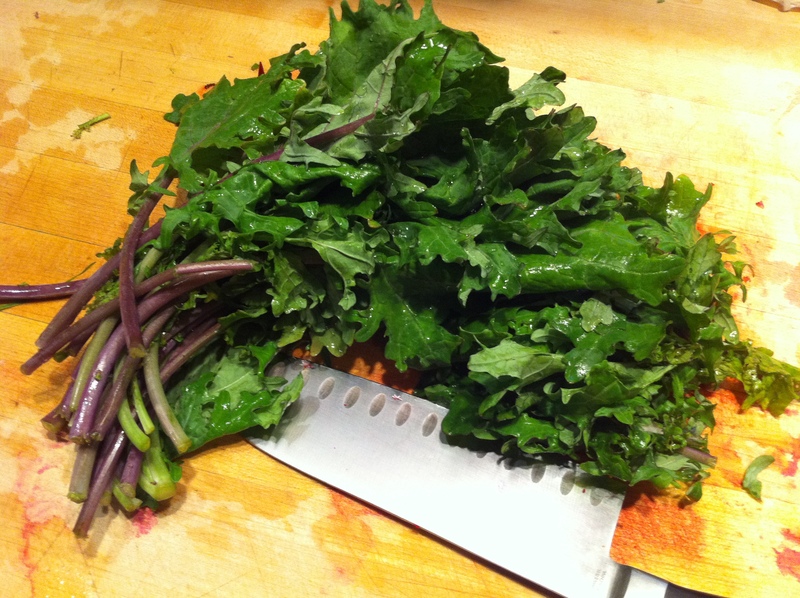 If you decide to use kale, remove the tough stems and use only the leaves. I chose to use black kale this time because it was available at market and it is slightly softer than the regular kale that I usually find. After experimenting a bit, I still really like using the swiss chard.You can use the stems of the Swiss chard too, the red and yellow colors are a nice addition. 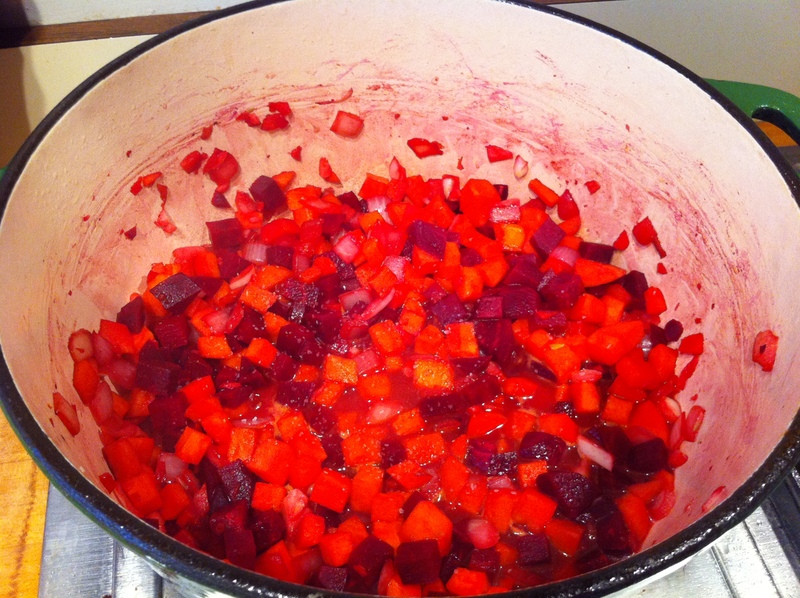 Use 1 cup of chicken or vegetable stock to deglaze your pot, scraping any bits from the bottom of the pan. Add the swiss chard or kale and season with salt and pepper. Place the lid on the pot and allow the liquid to boil and cook down the greens (about 7 minutes). When the greens have reduced in volume, add in the beans. replace the lid and bring the liquid back up to a bubble. 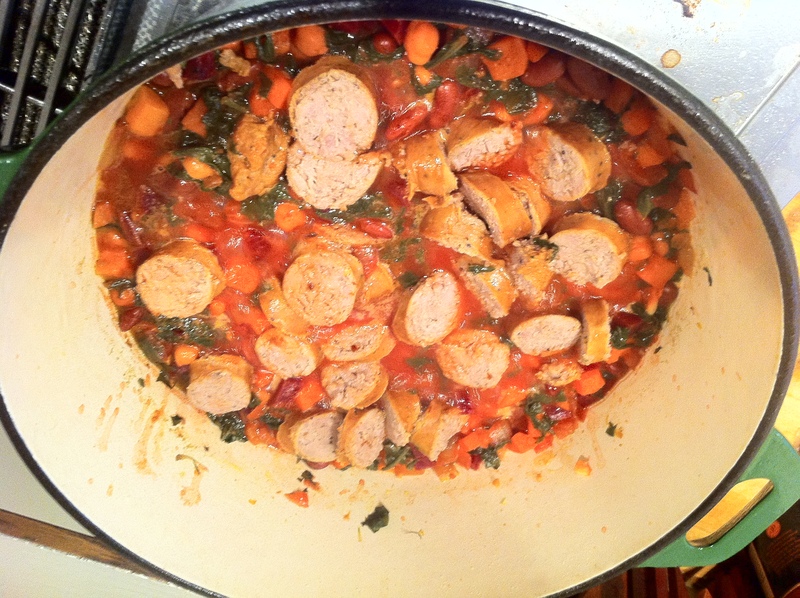 Nestle the sausages back in the pot vegetables. Try to submerge it under the liquid and cover the pot again, bringing the liquid back up to a boil. Allow the sausages finish cooking (about 5-10 minutes, depending on size). 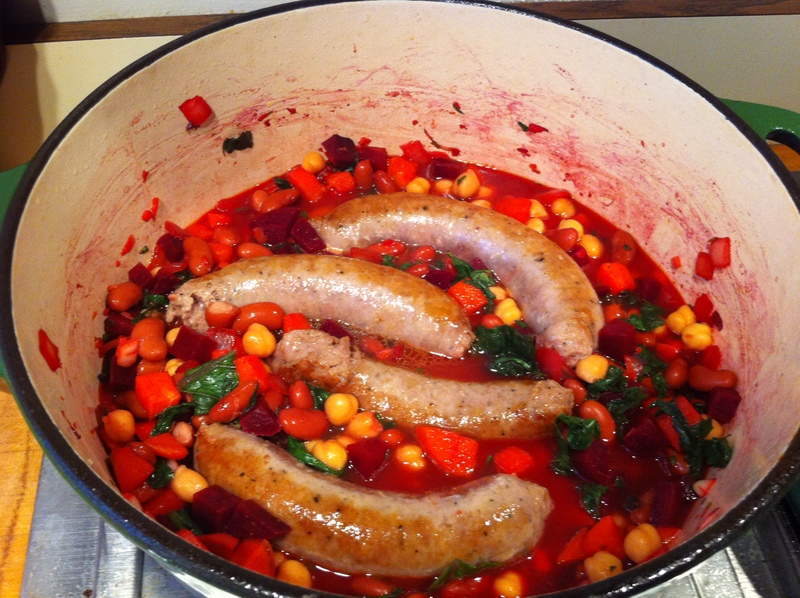 Remove the sausages and slice them into pieces, add the sausages back into the pot and serve…. comfort food for a chilly day.